Rosalind Russell in a portrait still from Auntie Mame (1958). Rosalind Russell did the impossible. 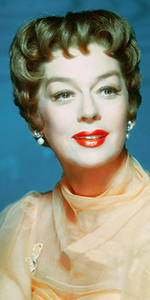 After years of supporting and lead roles in great Hollywood movies, she went to New York and starred in a hit play, and came back to Hollywood to make the film of Auntie Mame, which became her signature role (and the biggest hit Warner Bros had for 1959). Born into a large Irish Catholic family, Russell's father was a lawyer, while her mother was a teacher. She was educated in Catholic schools: Rosemont College in Pennsylvania, and Marymnount College in Tarrytown, New York. Without her parent's permission, she attended the American Academy of Dramatic Arts in New York City. After graduation, she did summer stock and then became a member of a repertory company in Boston. Russell snagged a role in the Boroadway musical revue Garrick Gayeties in October, 1930, but it flopped. She attempted a career in opera, but she didn't have the voice for it. She was in the Broadway play Company's Coming in April, 1931, but it flopped too. Setting her sights on Hollywood, Russell was hired as a contract player at Universal. She later admitted to loathing the place, where they didn't know what to do with her. She found trying to fit in at Universal so disheartening that she became determined to finding a spot at M-G-M. She was tested and was offered a contract. Her debut M-G-M film was Evelyn Prentice (which played the Chinese in December, 1934). She played supporting roles in stuff like West Point of the Air (played the Chinese in May, 1935). Moving up the ladder, Russell co-starred with George Raft in It Had to Happen (played the Chinese in February, 1936). Russell was on a sob-sister trajectory, headlining in pictures like Craig's Wife (released in September, 1936), and The Citadel (released in October, 1938). Tired of being a "clothes horse" and wanting more interesting roles to play, director George Cukor cast her in a supporting role in the comedy The Women (which premiered at the Chinese in August, 1939). With the film a hit, people bagan to look at Russell differently. To her great surprise, she read in the newspaper that director Howard Hawks had cast her to play Hildy Johnson (a role refused by nearly every leading lady in Hollywood) opposite Cary Grant in his remake of The Front Page, His Girl Friday (released in January, 1940). So now, comedies was her thing; she starred in No Time for Comedy (released in September, 1940), and Design for Scandal (which played the Chinese in February, 1942). She then starred in the very popular film My Sister Eileen (released in September, 1942). Russell took time off from acting in 1944, supposedly suffering a nervous breakdown. But in 1946, she went way out on a limb, starring in a film of Eugene O'Neill's Mourning Become Electra (released in November, 1947). The film did not please the public. Russell headed to Broadway to appear in a musical version of My Sister Eileen; she appeared in Wonderful Town from February, 1953 to July, 1954, receiving the Tony Award for playing Ruth Sherwood with Edith Adams as Eileen Sherwood. the show ran for 559 perfs. She also starred in a television version of the show, broadcast over CBS on November 30, 1958. Away from Hollywood, Rosalind Russell opened the greatest chapter of her career. A Broadway adaptation of a runaway best-selling book, Auntie Mame starred a radiant Russell in the title role and ran from October, 1956 to June 28, 1958, or 639 performances. So successful was Russell in this play, that she was able to get her director, Morton DaCosta, to direct the film. Lavishly produced, the film of Auntie Mame (which played the Chinese in December, 1958) became an instant mega-hit, and became the role for which Russell is best remembered today. Since everyone knew this was "one for the ages," the Chinese had Russell come out during the run of the picture to do her footprints. With a movie-going public wanting to see more, Russell continued making films into the 1960s, scoring a huge impression as Gypsy Rose Lee's mother in the film version of Gypsy (released in November, 1962), and played a Catholic girl's school mother superior in The Trouble with Angels (released in March, 1966). This film was popular enough to warrant a sequel, Where Angels Go. . . Trouble Follows (released in April, 1968). She received the Jean Hersholt Humanitarian Award from AMPAS in 1972. In March, 1973, FILMEX, as a tribute to their founding board member, ran Auntie Mame, after which Russell appeared before the sold-out house at the Hollywood Paramount for a Q & A. The audience adored her. Rosalind Russell, so beloved by so many, succumed to breast cancer in November, 1976. Her autobiography, Life Is a Banquet, was published a year later. The University of California at San Francisco has named their Arthritis Research Center for her. Grauman's Chinese Theatre, Hollywood, California. Rosalind Russell Forecourt ceremony, Thursday, February 19, 1959. 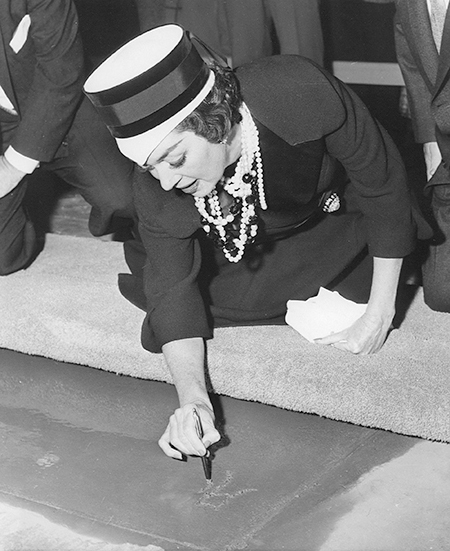 Rosalind Russell begins to sign her name in the cement.